Really Reasonable Ribbon Blog: Naughty or Nice? Well, this post is bittersweet for me, it's my last post with RRR. I have enjoyed my time here tremendously and am happy to have made some new and lasting scrappy friends! The new DT will keep inspiring us and I will still be visiting all the time! Thank you to Bonnie and the entire team! I am in the Christmas spirit and thought I would use some of the ribbon from Christmas Sheer with Satin Center assortment. This ribbon is just perfect for any Christmas project that you have planned! I used MOXXIE Party at the Pole paper and diecuts. I also added some Baker's Twine in Cherry, just a few little bows!!! I made the candy pieces by just drawing circles and using my Zig markers. I added a little bit of the sparkle with "Wink of Stella" by Zig too. I added the little Baker's Twine bows to the center of a few. 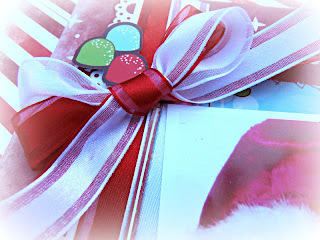 Here is a close up of the double bow, where I used the red and white ribbon from the assortment. It looks so festive together! Here is another closeup of the little candy pieces with the Baker's Twine. I had so much fun playing with this page! I'm going to get a head start on my Christmas cards with some of this ribbon too! Well, thank you so much for stopping by, and thank you for all the sweet comments you've left on my posts over my term here! I have really enjoyed working with these gorgeous ribbons and trim. I will continue to buy them now, I am totally hooked!!! Don't forget to come back by to see what else the DT has in store!!! Such a wonderful Layout, Patti! Full of vibrant colors and Christmas climate. Such a cute double bow! I just love it! So sad that this is your last post. You are so talented especially with the clustering. I love the page! Great pics too! Sad that you are done cause you rock these projects! Love this...just so dang fun! 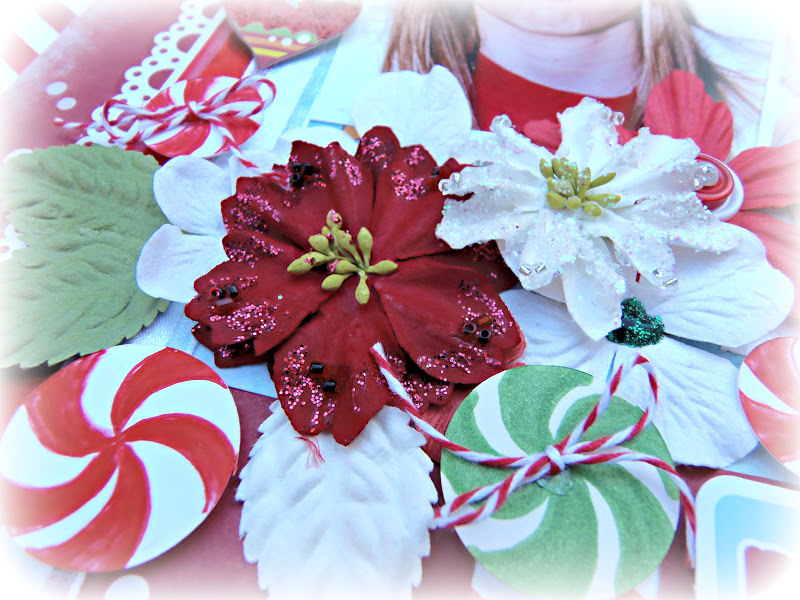 There is so much holiday joy in this layout, Patti- just beautiful! Makes me ache even more for Christmas to be here :)~ fab work my friend! Gorgeous layout! Lovely embellies. Great Christmas page! Patti, this is just gorgeous! Thank you for all of your wonderful inspiration! What a fabulous Christmas page! Those photos just make you smile--this page really does make you yearn for Christmas...lovely work as always! Absolutely love this layout! Such fun photos and great paper to put it with, but the way you highlight it all with the ribbon is just fantastic!! Beautiful and cheery! I really love that double bow, soooo gorgeous!! a beautiful design and layout. Love the double bow and embellishments!! 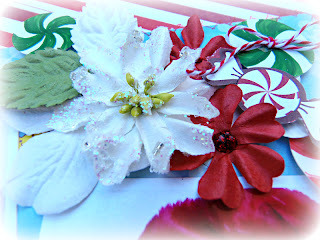 Totally cute projects - I love the high contrast of the red and white one! it is such a bright and fun LO, Patti! love how you kept the color scheme from your photos on the page! great project! HA! What great pictures! So TALENTED!! wow! super gorgeous !love teh fun photos! and the ribbons just add such a nice touch! WOOOOW Patti!!!!! Such a gorgeous page with perfect vibrant color combi and great photos!!!! Thank you so much for the amazing inspiration! This is just beautiful, Patti! I know you'll be missed on this team as your projects are always so pretty and inspiring. What a cheerful and fun page this is! Love it Patti!!!! The colours are shiny and bright and the bow just lovely! What a fun layout! I love your daughter's expressions! 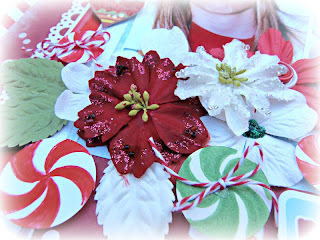 You have such a gift for creating embellishment clusters - love the peppermint striped background paper. This is just fabulous I adore the clusters you have created!